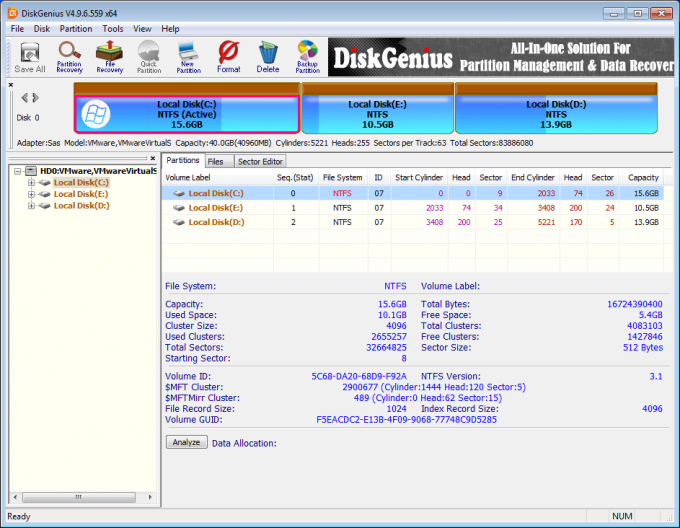 DiskGenius is a data recovery software developed by EASSOS Technology Co., Ltd. The software is an all-in-one solution for IT administrators when it comes to securing important files, as well as for backup purposes. EASSOS Technology Co., Ltd. is an international software company that focuses on developing various IT solutions for every enterprise. The IT company was founded in 2010 to provide services such as data backup and recovery, as well as disk management. Their years of experience have satisfied every user since they produce industry-grade data management services. The software provides several functionalities regarding file management. Nobody knows when a data breach or loss of data will occur on any enterprise. This is helpful most especially for IT administrators who are tasked to keep enterprise files secured at all times. Data Recovery is used for instances where enterprise files are unexpectedly lost. Nobody expects troubling issue regarding data loss but this software can solve it. It is capable of recovering files in any situation. Data are lost from instances like sudden Windows crash, file deletion, a result of RAW partition loss, system format or factory reset without any backup, virus, hard drive damage or bad sectors, disk corruption causing unreadable data, running FDISK or other utilities, and even human error. The required steps for initializing Data Recovery are selecting a specific partition or drive of the lost file’s last location, initiating the quick and deep scan, previewing any recoverable files, selecting and saving the salvaged files in another device. The original lost file is kept intact without any modifications. Data Recovery is also available for pausing, restarting or even stopping. The software ensures that the response speed is improved when it comes to accessing a damaged disk, depending on some cases. Partition Manager is utilized for enhancing disk space and usage for any business system. Some of the one-click partition options available options are: Copy, Create, Delete, Erase, Extend, Format, Hide, and Resize or Split. It also has an optimized file recovery capacity for EXT4 partition, FAT32 partition, and NTFS partition. Every information copied is transferable to another driver while retaining the same information. Users can also create a WinPE bootable disk where they can manage disk partition. This is ideal for having a backup operating system for computers if the main system crashes. This feature also includes a disk & partition converter for PC and workstation for handling storage space efficiently. They can convert MBR to GTP, Dynamic to Basic Disk, Primary to Logical Drive, any Virtual Disk Formats, and USB Disks To FDD or ZIP Mode. The partition recovery function will accept a specified partition while preventing exceptions. Files are listed when the software recover files from FAT partition. Any MBR created by the software’s Quick Partition is accurately made. Any operating system that is cloned from the FAT16/FAT32 system partition can be booted easily. Backup & Restore is for securing enterprise files. Users can make a system image backup for the current OS. It only takes a few steps to secure the current operating system of any systems. This functionality from the software features OS and system related partition backup, quick and safe OS restoration, full and incremental backup options, BIOS and UEFI Compatibility, WinPE Media Builder and compatibility with Windows 10. Backup & Restore is also connected with Partition Backup for protecting files. Users can backup files with Image Partition, Clone existing Image Partition and Browse image files. The software can backup on external devices. They are allowed to do Clone Disk, create Image Hard Drive and have MBR & GPT Disk Backup files. It can accommodate up to 16TB and non-512 byte drives. The software has an intuitive backup system so that anyone can use it for the personal and professional level. Disk Utilities are equipped with extra functionalities like Check & Repair Bad Sectors, S.M.A.R.T. Information, Wipe Hard Drive, Permanent Delete Files and Erase Free Space, Hex Editor, 4K Alignment Checker, Batch Formatting of USB Drives, Rebuild MBR, Partition Table Error Checker, and LVM Compatibility. The progress bar for doing a backup is able to be halted when registering any application while offline. The unformatted partitions meanwhile are displayed once they are resized. DiskGenius is ideal for today’s business enterprises because everything will be lost once all files are destroyed. Keeping a copy of files is very essential as threats are becoming apparent online. Salvaging enterprise files can also save everything that seems to be forever gone. With PartitionGuru, you can recover lost files, lost or invalid partitions. It supports RAID recovery, supports sector edit. Besides data recovery, PartitionGuru is a powerful partition management program, you can create, format, resize or backup partition with it. Numberous disk utilities are provided by PartitionGuru, such as Quick Partiton, Disk Clone, Files' Permanent Deletion, etc. It's Windows7 compatible. What do you think about DiskGenius Standard? Do you recommend it? Why?